DISCLAIMER - Boston Real Estate Attorney. Eviction Law. Zoning and Variances. Housing Discrimination. As a user of this website, you understand that our firm members may not be licensed to practice law in the state where you live and that, therefore, you should probably contact lawyers in your home state regarding your specific issues, if your home state is NOT Massachusetts. You further understand that any emails sent to the firm are only partly secure at best and that our firm cannot therefore guarantee the privacy of such communications. DISCLAIMER: Advertising. 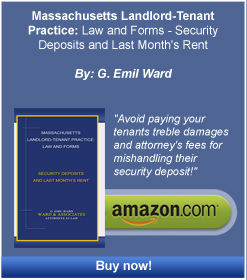 In accordance with rules established by the Supreme Judicial Court of Massachusetts, this web site must be labeled “advertising.” It is designed to provide general information for clients and friends of the firm and should not be construed as legal advice, or legal opinion on any specific facts or circumstances. This web site is designed for general information only. The information presented on this site should not be construed to be formal legal advice nor the formation of a lawyer/client relationship. As a user of the website, you understand and agree to the above-stated terms and conditions for use of this website. You also understand that an attorney-client relationship can only be entered into by signing a fee agreement with our firm.